On Monday night the Village of Owego decided to conduct environmental assessment before voting on the Inflection-wastewater sale. Before a standing-room-only crowd, the village Board of Trustees voted to retain the legal services of Syracuse law firm Hancock and Estabrook to assist in the environmental review and regulatory compliance. 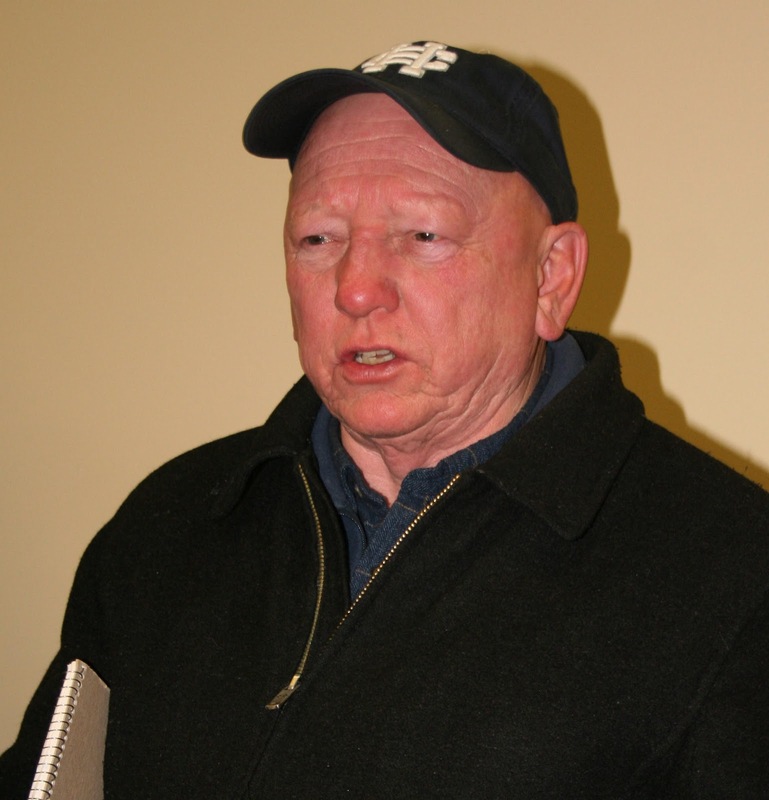 Owego Mayor Ed Arrington explained that the board was not prepared to vote on the sale at that time. “There is still additional work to be done,” he said. The deal, which could potentially generate as much as $3.6 million a year for the cash-strapped village, still leaves a lot of questions unanswered. Residents want to know whether the Village is limited in selling only to Inflection, how – and whether – the agreement can be renewed, and who pays for the development of the pumping site. The problem is that no one – except Village officials, Inflection representatives and a bunch of lawyers – has read the agreement. That’s because village attorney Irene Graven is denying all FOIL requests for documents related to the sale. 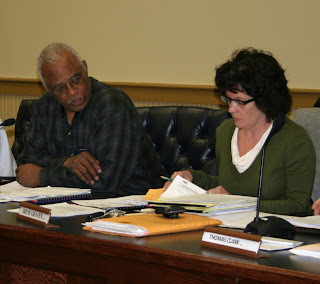 “The agreement may be impaired if it is released right now,” Graven said at Monday night’s meeting. Environmental attorney Helen Slottje insists that there is no basis under the Freedom of Information Act to keep the agreement under cover, and Robert Freeman of the NY Committee on Open Government concurs. Graven acknowledged the difference in opinions and left an opening to revise her stance. “I’m reviewing the (FOIL) requests,” she said last night. People need an opportunity to see the proposed agreement, says Kevin Millar. The village resident has, through conversations with board members, learned that the contract ties the village into a ten-year lease with Inflection. This coming Monday, December 20, the Village of Owego Board of Trustees will consider an offer from Inflection Energy LLC to purchase effluent from the municipal wastewater treatment plant (WWTP) for use in gas drilling operations. Yup, you heard right - someone wants to buy the stuff that comes out of the sewage plant, mix it with fracking chemicals and inject it into Marcellus wells for fracturing the shale. Right now the Village discharges the effluent (treated wastewater) into the Susquehanna River. If Inflection has its way, the Village could turn sewage into gold – or at least cold hard cash. Close to $3.65 million a year, according to the presentations on the Village website. The deal, mayor Ed Arrington explained a couple weeks ago, is that Inflection would purchase up to 200,000 gallons of effluent for 5 cents a gallon. There’s a minor glitch – if the treatment plant hopes to sell the effluent, they need to install an ultraviolet disinfection unit. And that will cost about $400,000. Not to worry, says Inflection. The corporation will front the costs and recoup their investment by paying only two-and-a-half cents a gallon for water they use until the loan is paid off. Which, says the mayor, could be as few as eighty days, if they are using the water at their maximum capacity. Or longer, if they only use a fraction of the water. Selling WWTP effluent is not an idea unique to the Village elders. Three years ago Prescott Arizona auctioned off their effluent at $24,650/acre foot - that's 7.5 cents/gallon. If Owego charged that much they could potentially haul in a couple million over the price Inflection has offered. And, says Bret Jennings, Director for the Hallstead Great Bend Joint Sewer Authority, some municipalities in PA are charging even more. Of course, there are some potential problems with the sale, increased truck traffic being a prime concern. It was just a year ago that Mayor Ed Arrington objected to Patriot Water due to the truck traffic it would bring through the village. Why not? Well, Sedlacek explained, “the village attorney says it is a negotiation, not a contract.” Village attorney Irene Graven has not responded to a telephone request for clarification. “The agreement should be a public document,” says environmental attorney Helen Slottje. She feels that the Owego officials are illegally denying citizens access to a document that even the Council of Mayors deems a public document. Not only that, the public won’t be allowed any time to comment on the proposed deal before the Village Board addresses the issue – privilege of the floor is second on the agenda. The Board meets Monday, Dec 20 at 7 pm in Hubbard Auditorium at 56 Main Street, Owego following a brief public hearing on some local laws. 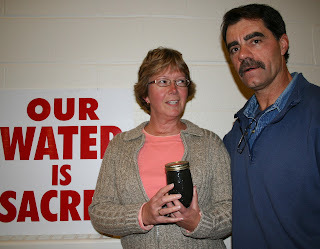 Dimock water or bottled water? asks Craig Sautner. Today the PA Department of Environmental Protection announced that Cabot Oil and Gas Co. has agreed to pay $4.1 million to residents of Dimock Township, Susquehanna County, who have had their drinking water supplies contaminated by the drilling. The settlement negotiated between Cabot and DEP will “enable the affected families to address their individual circumstances as they see fit,” says DEP officials. It also binds Cabot to offer and pay to install whole-house gas mitigation devices in each of the 19 affected homes. In addition, Cabot will pay DEP $500,000 to offset the state’s expense of investigating the problems in Dimock. DEP Secretary John Hanger explained that the amount paid to each family will equal two-times the value of their home, with a minimum payment of $50,000. “In addition to the significant monetary component of this settlement, there is a requirement that Cabot continue to work with us to ensure that none of their wells allow gas to migrate,” Hanger noted. According to a press release from Cabot, upon compliance with the terms of this agreement the company will be allowed to resume well completion operations in the Dimock/Carter Road area. They hope to begin those operations in the first three months of 2011, with new drilling commencing before June. Of course, this settlement is only the latest in a series. In November 2009 DEP issued a consent order and agreement requiring Cabot to install whole-house treatment systems in 14 of the Dimock homes. Residents complained that Cabot’s actions did not solve the problem. Five months later, in April 2010 DEP ordered Cabot to cap three wells and put a halt to drilling. Five months after that, in September, DEP promised to construct a 5.5-mile water main from the Lake Montrose water treatment plant to Dimock because Cabot wasn’t fulfilling any of the agreements for solving Dimock water woes. The water pipeline would cost the taxpayers close to $12 million – a cost DRP said it would recover from Cabot. Faced with the prospect of paying higher taxes to provide fresh drinking water to their neighbors, several Montrose businesses fomented an “Enough Already” campaign to rally citizens against the pipeline project (The Inn at Montrose, Warner Quarries, Guy Parrish's, Lockharts, Brunges Commercial Supply, Taylor Rentals, PJ's Cafe and the Rock Mountain Sporting Clays - flip to page 2). “Our primary goal at the department has always been to ensure that the wells Cabot drilled in Dimock were safe and that they were not contaminating local private water supplies,” said Hanger. NY Governor David Paterson has figured out how to have his cake and eat it too. By vetoing the fracking moratorium and banning permits for high-volume horizontal hydro-fracking until July 2011 he’s got both industry and the environmentalists singing his praises. Why veto the moratorium? Even though tens of thousands of citizens lobbied for a moratorium on hydro-fracking, Paterson expressed concern that the bill went too far. That included vertical wells and, depending on how one interprets “low permeability”, might have halted drilling in other strata. Convinced by industry that too many jobs would be lost – some 5,000 – the guv vetoed the bill. Paterson made industry happy. “We are very pleased that the governor saw the bill for what it was – a flawed piece of legislation replete with unintended and dire consequences for the people and businesses in our industry,” said Brad Gill, executive director of the Independent Oil and Gas Association of NY (IOGA-NY). New York Farm Bureau actively opposed the moratorium too, posting an “action alert” on their website. Within a week close to 600 people sent anti-moratorium letters to the governor from the NYFB’s site. Landowners had reason to cheer as well. Ever since Paterson directed DEC to develop a Supplemental Generic Environmental Impact Statement (SGEIS), Chesapeake and Fortuna have threatened to invoke “force majeure” in order to extend their leases. A force majeure clause in a lease allows the terms of a lease to be extended under unforeseen circumstances. It was intended to protect a contractor who cannot complete his project given such things as hurricanes or union strikes. But the gas industry argues that being prevented from drilling horizontal fracked wells in Marcellus – even though they can drill vertically or exploit other strata – is stopping them from doing business. Landowners worried that a moratorium would indeed justify the industry’s force majeure argument. Paterson also made the environmental community happy. “He’s given us more time to evaluate the critical issue of high-volume horizontal hydro-fracking,” said Katherine Nadeau of Environmental Advocates of NY. Assemblywoman Barbara Lifton explained that an Executive Order, no matter how good, is second best to legislation. A statute, she points out, would not fact the risk of being rescinded by Governor Cuomo when he takes office. “There was also a lot of misinformation from the industry,” Lifton said. Regardless of how safe people insist the current drilling technology is, there are problems with vertical wells. That’s why the moratorium included vertical wells, Lifton said. Indeed, it was vertical Marcellus wells that contaminated the drinking water wells in Dimock, PA.
What does the Executive Order really say? Not much, when you really read it. In comments prepared for the press the Governor emphasized that before drilling requiring high-volume horizontal hydro-fracking begins, there must be absolutely no doubt that the technique is safe. “The enormous revenues that could eventuate from such drilling would not be worth the cost of serious environmental harm,” Paterson said. He added that he wants DEC to examine all available evidence, including data from other states. Continue prohibiting permits for high-volume horizontal hydro-fracking until the completion of a Final SGEIS. So what is it we've ended up with? The drillers can drill - even vertical wells into Marcellus and Utica shale if that's where they want to spend their money. They can complete individual Environmental Impact Statements for horizontal Marcellus wells under the old GEIS rules. As for the Executive Order - the governor pretty much says "get 'er done" in the next six months. Corrections made 12/13 at bottom of post. This afternoon Governor David A. Paterson vetoed the moratorium bills, S.8129-B/A.11443-B, which would have suspended issuing new drilling permits through May 15, 2011. Contemporaneous with his veto, Paterson issued an Executive Order which directs the Department of Environmental Conservation (DEC) to conduct further comprehensive review and analysis of high-volume hydraulic fracturing in the Marcellus Shale. 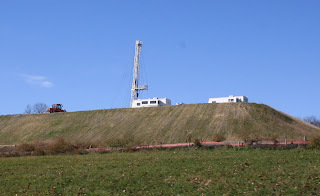 The Executive Order requires that, if approved, high-volume, horizontal hydraulic fracturing would not be permitted until July 1, 2011, at the earliest. Read the press release concerning the executive order here. On Dec. 13 the executive order was posted to the Governor's website here. Grimy, fizzy, combustible. That’s how Joe and Bonnie Todd describe their water. It’s full of sediment and has so much methane that the gas causes vapor-lock in the water tank – something Bonnie found out when she was trying to run a load of laundry. The Todds believe their water woes are related to gas drilling activity about 3,000 feet to the west. Over the summer Anschutz Exploration Corporation drilled a couple gas wells on the Dow farm up Yawger Road. 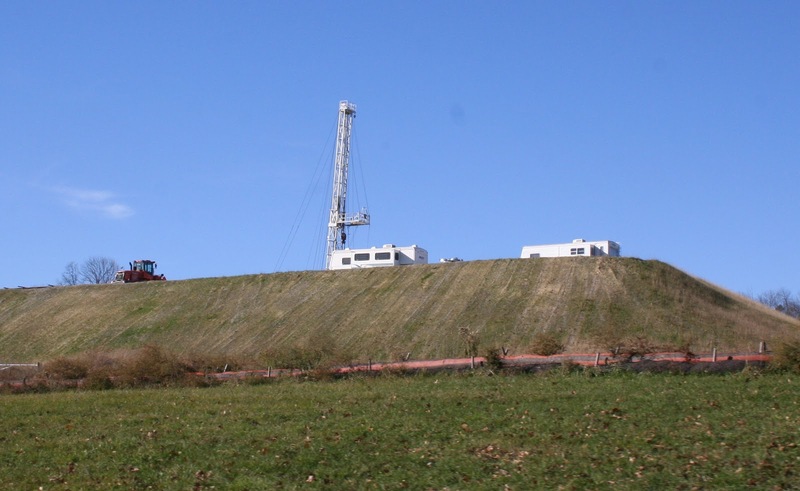 They’re looking for gas in the Trenton-Black River layer – a dolomite formation buried thousands of feet below the Marcellus shale. The gas lies trapped in grabens, or troughs, situated between parallel faults. Getting gas out of dolomite pockets doesn’t require the same kind of hydraulic fracturing used in Marcellus wells. But the drillers still have to stimulate the deep wells to get the gas flowing. They still need to drill through layers of stone, crossing through aquifers on their way down. And that means using drilling muds and friction-reducing chemicals. It also means injecting a weak solution of hydrochloric acid to dissolve any residual limestone in the dolomite. “I was told the well would be a deep well,” Joe said. “I was told we wouldn’t be dealing with fracking chemicals.” He never expected methane to be a problem. As for the sediment – DEC attributes that to seasonal fluctuations or mechanical failures of the homeowners’ wells. But, the Todds point out, what’s the likelihood of ten different homes experiencing the same problem at the same time? What frustrates the Todds is that they wanted nothing to do with drilling in the first place. They didn’t sign a lease. But enough people did sign, and by the beginning of the year the Todds were placed into the drilling unit by “compulsory integration”. In NY, when 60 percent of the landowners land in a drilling unit has been leased have leased their land, unleased land may be “pooled” into the unit. Read more here and here. Even though the Todds didn’t want to lease, Anschutz now had the right to drill and extract gas from beneath their property. 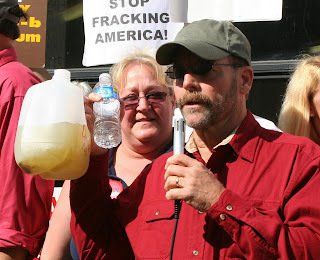 If this is what happens with a deep well, Joe asks, what will happen when they start drilling Marcellus Shale? To learn more about the issues surrounding compulsory integration and Big Flats, read Peter Mantius's excellent article here. You can read a longer article about the dirty water in Big Flats in this week’s Broader View Weekly. It will be posted here in a couple weeks. It’s amazing how much controversy 175 words can cause. Ever since the NY Assembly passed the moratorium (Assembly Bill 11443) industry representatives have been spinning it as a move that is sure to drive the state economy into ruin. “It’s putting drillers currently working in the state at risk,” Jim Smith said in a phone interview. Smith, who works with the NY Independent Oil and Gas Association of NY (IOGA-NY), explained that the moratorium could halt all natural gas development that uses hydraulic fracturing – not just drilling proposed for the Marcellus Shale. “Did they even read the bill before they voted?” Smith asked, referring to the 93 assembly members who voted aye. The more pertinent question is whether the good folks at IOGA-NY read the bill – it takes but a minute, maybe two if you read real slow, and is very clear about what the moratorium is. The moratorium, explains Assemblywoman Barbara Lifton, will allow the state more time to obtain a complete picture of environmental impacts from the technology. She would rather see the state wait until after the EPA completes their study before issuing new permits… but this is what ended up on the table – er, floor of the Assembly Monday night. It wasn’t a shoo-in, either. Assembly members engaged in lengthy discussion, bringing numerous questions to the chair. Did they know that vertical drilling would be affected? Most assuredly, Lifton said. The bill does not specify horizontal fracturing because the concern is protecting water and the environment from the numerous toxic chemicals used in the hydro-fracking process – regardless of how the well is drilled. Lifton set the record straight: “The moratorium does not interfere with current drilling projects or permits that are in effect.” Indeed, anyone reading the actual text of the bill would notice that the first sentence clearly states the act establishes a “suspension of the issuance of new permits”. Please take a minute and read the bill here.